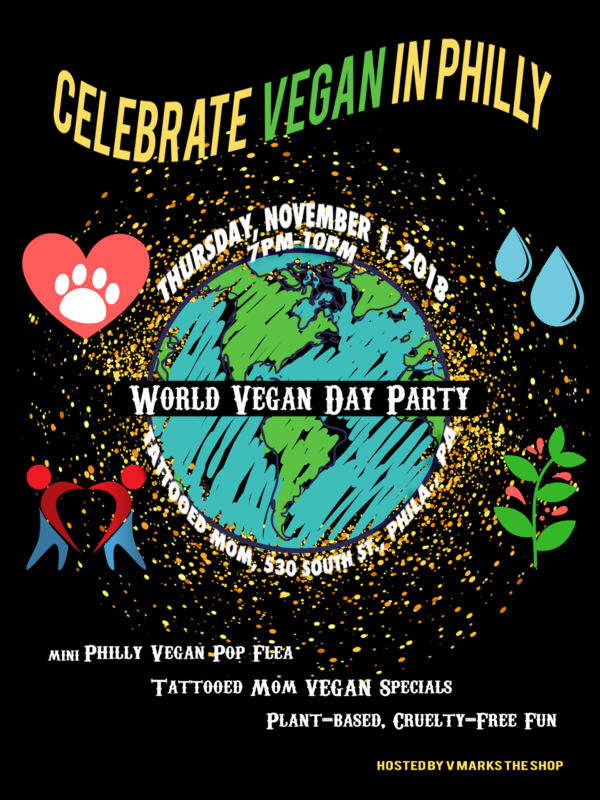 We cordially invite you to celebrate WORLD VEGAN DAY in the city of brotherly love with your friends at V Marks the Shop and Tattooed Mom! This event is FREE & 21+! & V Marks the Shop! Meet the fine folks of Blind Dog Rescue Alliance & learn about their work in helping non-human & humans connect! 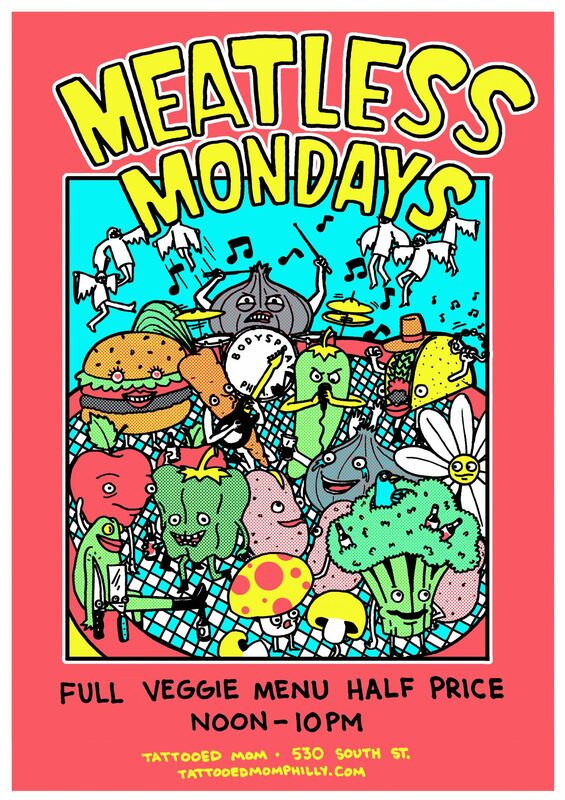 We’ll also be joined by the local vegan cheesesteak aficionado, Vance Lehmkuhl, who will be selling copies of his new book! available with several toppings & dipping sauces, like our new Vegan Jalapeño Cheese Whiz! ⇒ & dig into the new fall additions to our vegan menu! 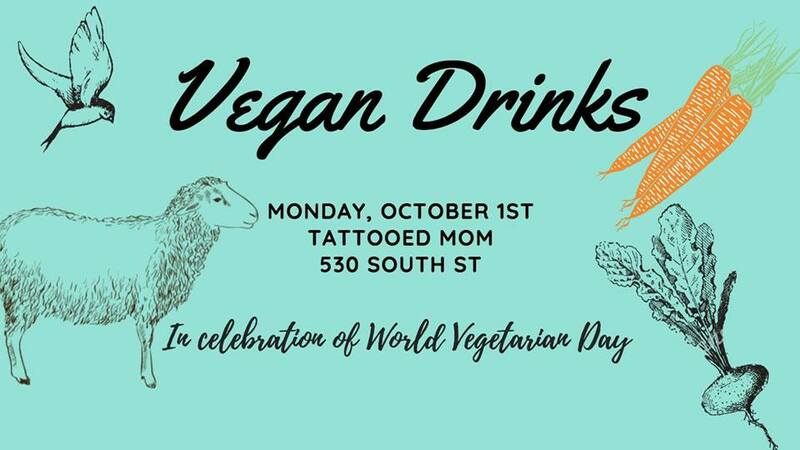 Leave a Comment on Vegan Drinks in Celebration of World Vegetarian Day! 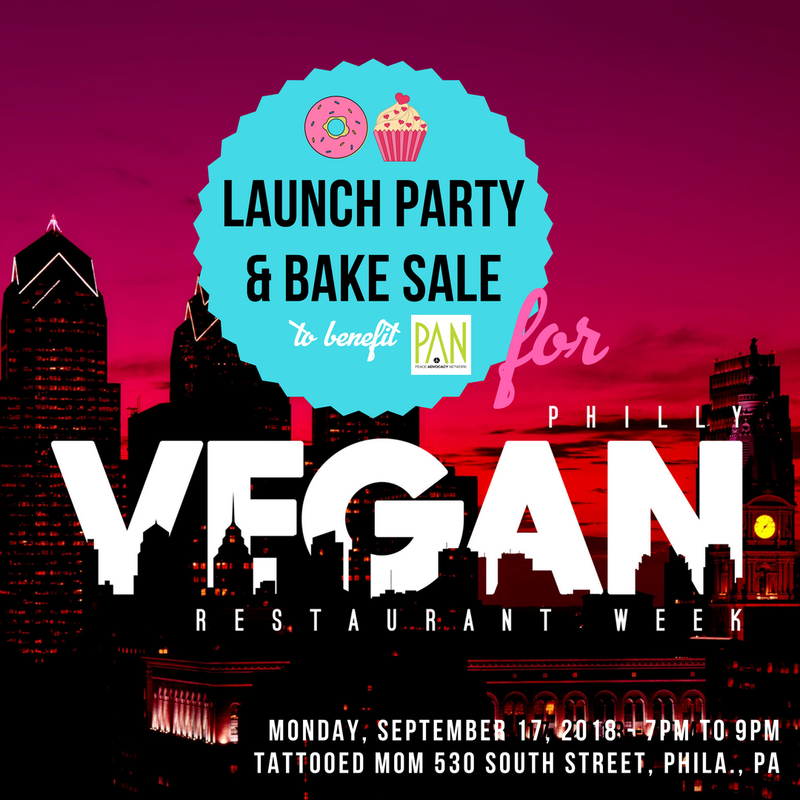 Leave a Comment on Philly Vegan Restaurant Week 2018 Launch Party & Bake Sale! 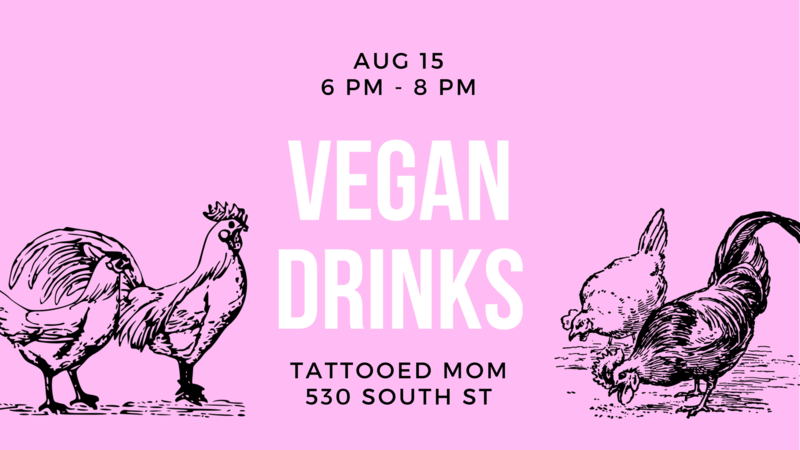 Join The Humane League of Philadelphia for some tasty drinks and delicious food on the 2nd floor of Tattooed Mom + a $4 special on the Angry Orchard Rosé Cider! The Humane League’s mission is to reduce animal suffering by creating change at all levels. They work to reform the way farm animals are treated while also inspiring people to make more compassionate food choices. This is a great opportunity to let loose and meet others who are interested in helping animals! 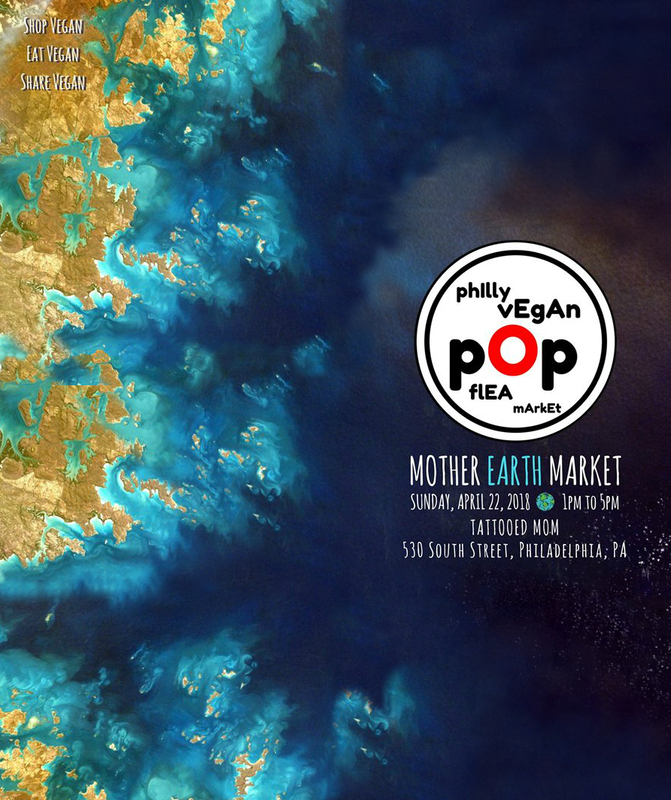 This event is a fun, friendly, & inclusive space for vegetarians, vegans, and veg-curious folks! They say “it takes a village,” but we’re a whole damned city! Let’s do this! 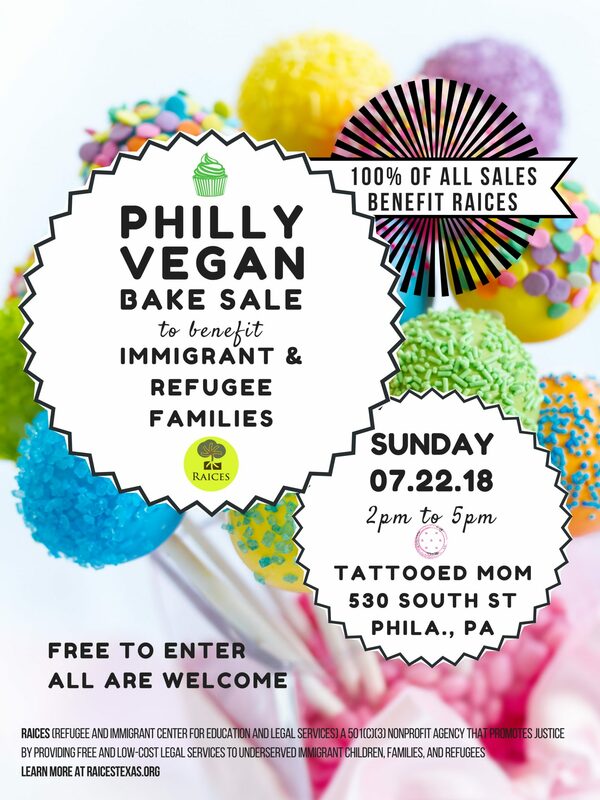 Inspired by Chicago’s vegan bake sale organized by our friend Marla Rose of Vegan Street, V Marks the Shop & Tattooed Mom are honored to host a community gathering and ALL-VEGAN bake sale to benefit RAICES (Refugee and Immigrant Center for Education and Legal Services) to aid in their efforts provide support to immigrant families seeking asylum in the United States! If you’re unable to attend, please share this event with your friends & family! The Refugee and Immigrant Center for Education and Legal Services (RAICES) is a 501(c)(3) charity that provides free and low-cost legal services to under-served immigrant children, families and refugees. RAICES has grown to be the largest immigration legal services provider in Texas, and is unique among immigration organizations. Their advocacy and commitment to change are driven by the clients and families we serve every day as our attorneys and legal assistants provide legal advocacy and representation in an immigration system that breaks apart families and leaves millions without pathways to legal status. This event is FREE to enter and open to ALL AGES! Disclaimer: This is not a vending opportunity. This is purely a volunteer-run fundraiser. All baked goods are donated for sale. All sale proceeds will be donated to RAICES. 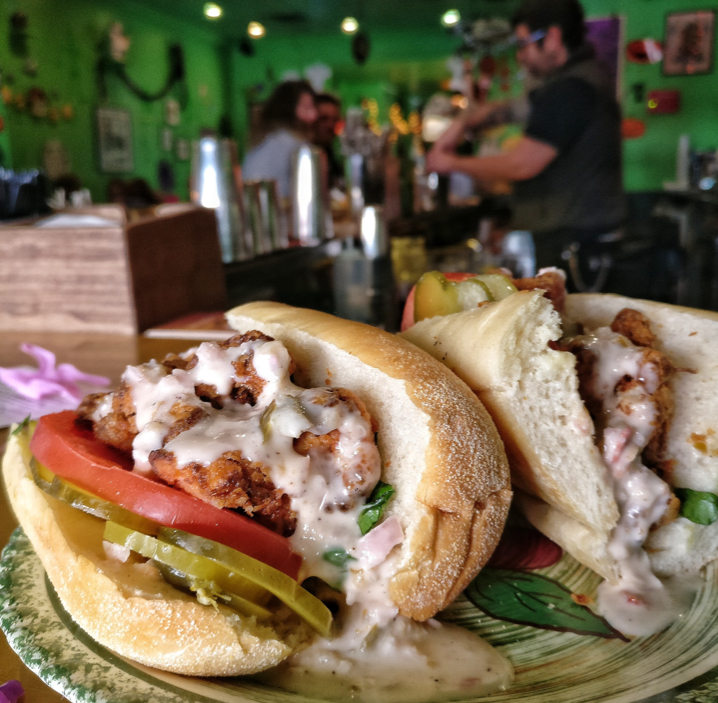 Honor the birth of a nation by letting your freak flag fly at TMOMs! Let’s make America WEIRD again by celebrating the creative spirit of the unsung underground, the freaky resistance of the true patriot, & the beautifully rich diversity of our incredible community. 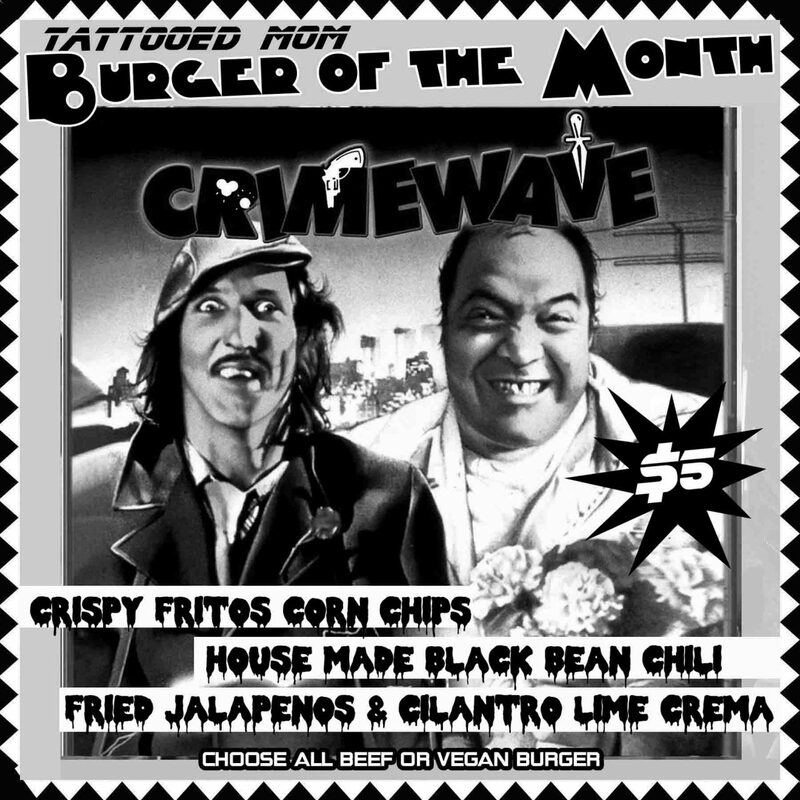 & catch the debut appearance of July’s Burger of the Month: Crimewave: Your choice of Mom’s Classic Burger or Mom’s Vegan Burger + crispy Fritos corn chips + house made black bean chili + fried jalapeños & cilantro lime crema. 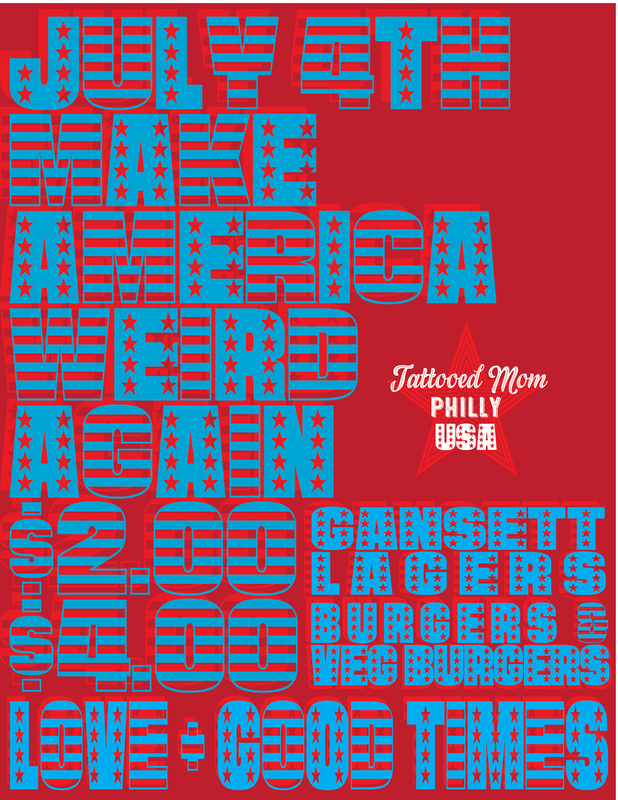 All this & more holiday shenanigans in air conditioned all-American comfort, only at your true blue Tattooed Mom! 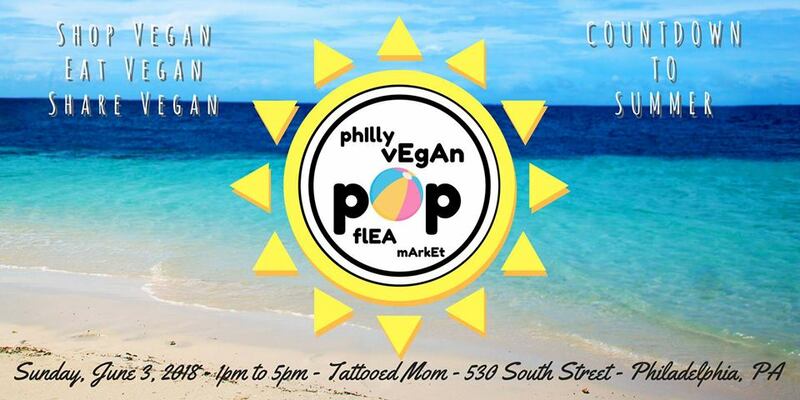 The weather can be deceiving, but we’re counting down to Summer ’18 with another Philly Vegan Pop Flea market at Tattooed Mom! 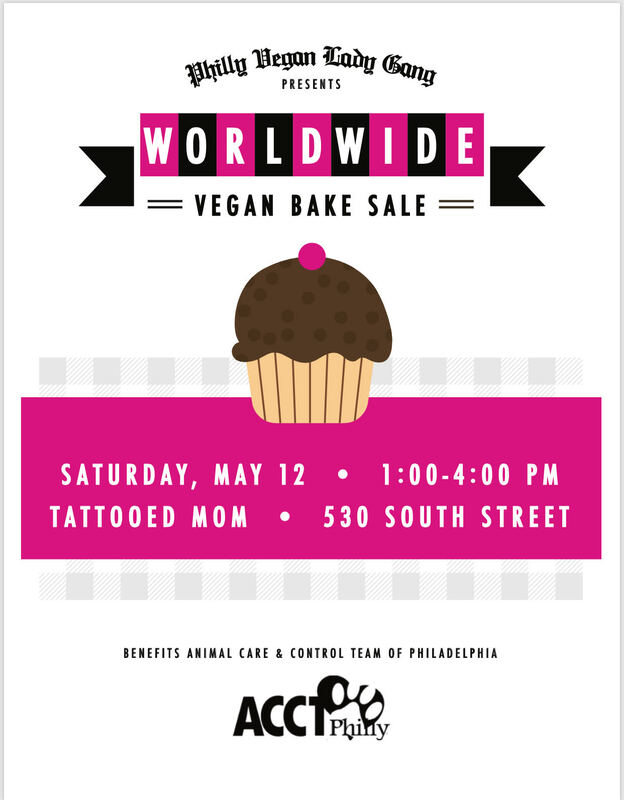 Get the chance to meet with representatives from our featured impacted organizations, Sea Shepherd Philadelphia & Food Empowerment Project, and snag some cute vegan products at the same time! Join the Facebook Event and invite all your friends!